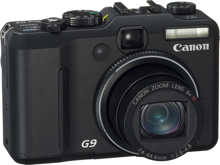 The Canon PowerShot G9 is a 12.1 megapixel camera with a 6x optical zoom and 3.0 inch high resolution LCD Screen. This update of the award winning G7 adds a variety of features, most notably RAW shooting mode. The Canon PowerShot G9 features face detection (auto focussing and auto exposure), a new thumb grip, compatability with Canon’s wireless flash transmitter, image stabilization, DIGIC III, ISO of up to 1600, 25 shooting modes, hot shoe flash plus lots more. The camera measures 106.4 x 71.9 x 42.5 mm (4.2 x 2.8 x 1.7 in) and weighs 320g (9.4 oz). CNET reviews the Canon PowerShot G9 and gives it a rating of 8 out of 10. They write – "Like its predecessor, the G9 offers all of the exposure, focus, and shooting controls any enthusiast would want. They include a spot meter, user-selectable focus zones, two custom settings modes, continuous- or shot-only IS settings, manual ISO settings up to 1,600 plus a High mode that reaches up to 3,200, voice annotation, and a hot shoe…. The Canon PowerShot G9 gets a leg up over its predecessor by improving photo quality and restoring raw-format support while maintaining the same excellent performance and body design. You probably can’t miss with this model as a compact backup for your dSLR." Digital Camera Review has reviewed the Canon Powershot G9 and writes – "As recently as two years ago many digital camera industry insiders were predicting the imminent demise of top of the line (read expensive) prosumer/enthusiast digital cameras due to the introduction of affordable entry-level digital SLRs – those dire prophecies clearly haven’t come to pass. The G9 has a few warts, but at this point in time and when compared to the other cameras in its class – the G9 is as good as it gets. If that’s not enough, RAW is back, the G9 is more powerful, it has more features, and it’s cheaper (MSRP) than its predecessor." The Online Photographer reviews the Canon G9 and writes – "I could probably write much more about the G9. It has many more features and highlights than I’ve noted. But I think you get the idea. It’s an exceptional little camera whose specs and performance would have been hard to imagine just a few years ago, particularly for $500. If you’re looking for a go-anywhere pocketable camera in this price range you owe it to yourself to look at Canon’s G9. I believe that it truly represents today’s gold standard for point & shoot camera performance and specifications." DCRP reviews the Canon PowerShot G9 where they write – "The PowerShot G9 is a solid high-end camera, though it won’t be replacing your digital SLR anytime soon. It offers a full set of features, both automatic and manual, and throws them into a well-built, expandable body. If you keep the ISO as low as possible you’ll get some nice photos out of the camera, though a D-SLR will wipe the floor with the G9 at higher sensitivities. Though I still miss the fast lens and rotating LCD of the older G-series models, I can still recommend the PowerShot G9 to anyone who wants a high-end camera without stepping up to a digital SLR." Cameras.co.uk has a review of the Canon Powershot G9 and writes, "the Powershot G9 is about the most advanced compact camera on the market. In terms of features it has a roll call similar to what you would expect from an SLR camera. It is ideal for a photography enthusiast or someone who owns an SLR, but is looking for a more portable second camera. … The Powershot G9 scores well in just about every area. It outperforms just about every other consumer camera on the market. … If quality is what counts for you the Canon Powershot G9 should be towards the top of your shortlist. It is packed with features, offers excellent picture quality and has a good build quality too."